The next 6 Bowie releases (Diamond Dogs to Lodger) plus promo obis. See Space Oddity Box for more details and scans. 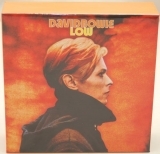 See DU-SP146.2 - Bowie, David - Space Oddity Box (2007 / 2007) for more details and scans.